Philly native, Michael Paul began his career in local television at age 16. Sustaining a 25 year comedy career, he honed his craft touring with such names as James Brown, Lisa Lampanelli, Wynonna, Joan Rivers and Don Rickles to become a headliner in over 40 countries along with television credits on The Tonight Show and Saturday Night Live. Michael’s film career includes motion pictures such as “27 Dresses” opposite Katherine Heigl, “The Ten” co-starring with Winona Ryder and Paul Rudd, and “The Ventriloquist” with Kevin Spacey. Also lending his voice to Pixar, Jim Henson Productions and Disney and is well known for creating branded puppet characters including, “Nadia Coma: The World’s Oldest Gymnast” and MTV‘s “CJ and Peanut” as well as training casts of “The Lion King” and “Avenue Q”. 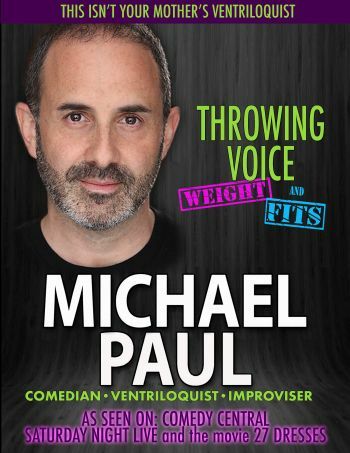 Michael’s published works include comedic editorials for USA Today, Huffington Post, LaughSpin and his new book “Breaking Out of Show Business: What I Discovered by Not Being Discovered” (by Post Hill Publishing) can be found at numerous book outlets including Amazon and Barnes and Noble. Behind the scenes Michael has provided script coverage or directing for America’s Got Talent, The Disney Channel, CBS Comedy Division, Robert DeNiro, Jenifer Hudson, Joshua Rush, Bradley Cooper, punched up jokes for David Letterman, Bill Maher, the Comedy Central Roasts and he has taught at UCLA, NYC, PACE, SAG-AFTRA’s Master Class and the Eugene O’Neil Conference. Michael resides in Los Angeles and continues to work in movies, television and as a comedy writer & script and show consultant.